Originally a train depot, 'The Depot' has been a staple food establishment in the area for years that serves classic American diner food with a Springfield, Illinois area twist. Ice cream, Hamburgers, Catfish, Tenderloins, and HORSESHOES! Make sure to not only look through this site for our menu, but ALSO check the fascinating story of the 'horseshoe', by far the one of the most famous (and delicious) foods in the area. If you are not a native to the area, do make sure to not miss this special item because it's a local treat only! The Horseshoe is a classic original and unique to Springfield, IL and it's neighboring small rural farming communities such as Virginia. At The Depot you will get an open face sandwich: bread on the bottom, then your choice of meat, a heaping plate of french fries, and finally topped off with a delicious cheese sauce! This gorgeous and filling dish was created by the head chef at the old Leland hotel in Springfield in 1928. Every restaurant has its own special twist and in some places a hotly contested ingredient has been shrimp and beer! Here at The Depot the choices for meat is one type of the following: Grilled or Breaded Chicken Strips, Hamburger, Tenderloin (again grilled or breaded), Turkey, Sausage, Ham, Roast Beef, or Bacon. The name "Horseshoe" came from the original design of the dish, which used Ham and a Fried Egg which represented a horseshoe shape, the fries representing the nails of the horseshoe, and the plate heated to represent an anvil. Either way, it's a delicious meal all in it's own! If it looks like too much food, there is a smaller version: the Ponyshoe which is 1/2 the size. Wanna try a Depot challenge?? Try the CLYDESDALE Horseshoe food challenge! Your first time out of the gate, if you finish, it's on us; also, your picture will be taken and put on the wall for The Depot Clydesdale Hall of Fame. Give it a Try, it's triple the meat, 4 slices of toast, and way more fries and cheese. 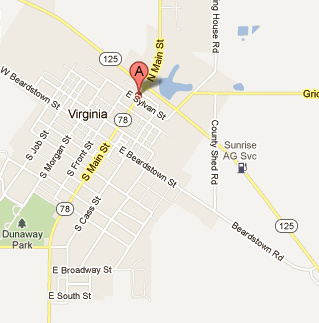 The depot is located at the IL-125 and IL-78 junction on the North side of Virginia, Illinois. VIA IL-78 : 30 minutes north of Jacksonville.